The DEWALT DCS520B 60V MAX 6-1/2" Cordless Track Saw features a zero clearance TrackSaw cutting system delivers precise, straight, splinter-free cuts. For use with TrackSaw dual-edged tracks for perfectly straight cuts in both directions. On-track cut depth: 2/1/8"(54mm) at 90; 1-5/8" (41mm) at 45. Brushless motor effortlessly powers through hardwoods up to 2/1/8" thick. 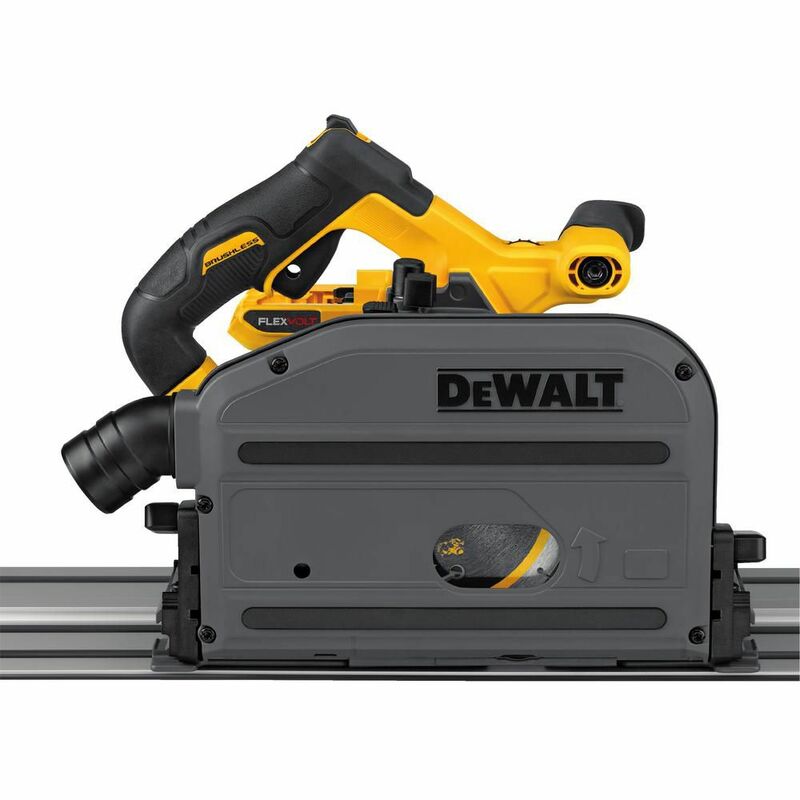 The DeWalt 6 1/2 inch (165mm) Cordless Circular Saw has 3,700 RPM for fast rip cuts and cross cuts as well as a high strength magnesium shoe and upper guard. The saw comes with a carbide tipped blade and offers users a 0-50 bevel capacity. The DeWALT 19-Pocket framer's combo apron with suspenders features a 5" padded, air-mesh fabric belt to reduce heat and moisture accumulation and fully adjustable suspenders to help to distribute weight more evenly. There are 8 main pockets with 11 smaller pockets and sleeves. FLEXVOLT 60V MAX 6-1/2-inch Cordless Track Saw - Tool Only The DEWALT DCS520B 60V MAX 6-1/2" Cordless Track Saw features a zero clearance TrackSaw cutting system delivers precise, straight, splinter-free cuts. For use with TrackSaw dual-edged tracks for perfectly straight cuts in both directions. On-track cut depth: 2/1/8"(54mm) at 90; 1-5/8" (41mm) at 45. Brushless motor effortlessly powers through hardwoods up to 2/1/8" thick. FLEXVOLT 60V MAX 6-1/2-inch Cordless Track Saw - Tool Only is rated 5.0 out of 5 by 17. Rated 5 out of 5 by TGMS from The DeWalt Cordless Track Saw works great. It has the power to cut thicker boards without the ha... The DeWalt Cordless Track Saw works great. It has the power to cut thicker boards without the hassle of a cord to get in the way. Rated 5 out of 5 by Todd from Having owned the corded track saw for last couple of... Having owned the corded track saw for last couple of years, I was excited to see the cordless version come out. Wow, talk about taking an already excellent product and making it better! Dropping the cord and powering with 60v batteries was a perfect addition to this system. Well done! Rated 5 out of 5 by Jim from Flexvolt is awesome and the track saw is no exception.... Flexvolt is awesome and the track saw is no exception. I had another track saw and the cord was always in the way. Great tool. Rated 5 out of 5 by Morgan from Great power and easy to use! Unlike several other track... Great power and easy to use! Unlike several other track saws that I’ve used, the 45 degree bevel came perfectly tuned right out of the box.